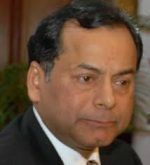 Ravikant Nand Kishore Ruia (born 1949) is the vice-chairman of Essar Group, co-founded in 1969 with his brother Shashi Ruia. In 2012, Forbes named the Ruia brothers as the world’s richest Indians with a net worth of US$7 billion. Ravi Ruia is a mechanical engineer by profession, with a degree from College of Engineering, Guindy in Chennai, and has played an important role in steering the Essar Group to its pre-eminent position. The [Essar Group] is a multinational conglomerate and a leading player in the sectors of steel, oil and gas, power, communications, shipping, ports and logistics, projects and minerals. With operations in more than 20 countries across five continents, the group employs 75,000 people, with revenues of US$17 billion. He was the 12th richest person living in the UK, as in the Sunday Times Rich List 2011. In December 2011, Ruia was charged by India’s Central Bureau of Investigation over alleged corruption involving the sale of India’s 2G spectrum. He was charged alongside two other executives from the Essar Group. In April 2013 he was awarded the Outstanding Contribution to Sustainability award at The Asian Awards in London.